SurCentro – Many times you read about a new website in the internet, but you don’t know if you can trust it and you feel that it would be great if you could check it’s background. Surcentro was created for that purpose. 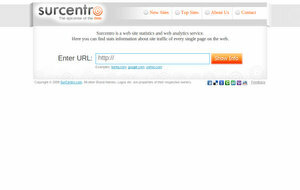 Surcentro is a web site statistics and web analytics service. Here you can find the amount of visitors, pagerank, indexed pages, view Alexa and Compete graphs and other additional information about every single page on the web. SurCentro is the creation of Alex Zani. To learn about what is new from SurCentro, simply follow the updates on Twitter @surcentro. Its nice to have journey to the site, nice colored /useful information overall best keep rocking….